The 4th of July means many things for Americans: the celebration of the signing of the Declaration of Independence, barbeques, family and friends, and fireworks. 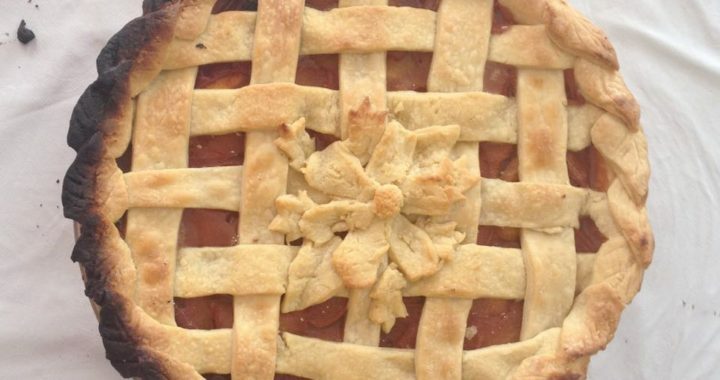 For many Americans, it also means fruit pies, a dessert that is especially popular on this holiday. 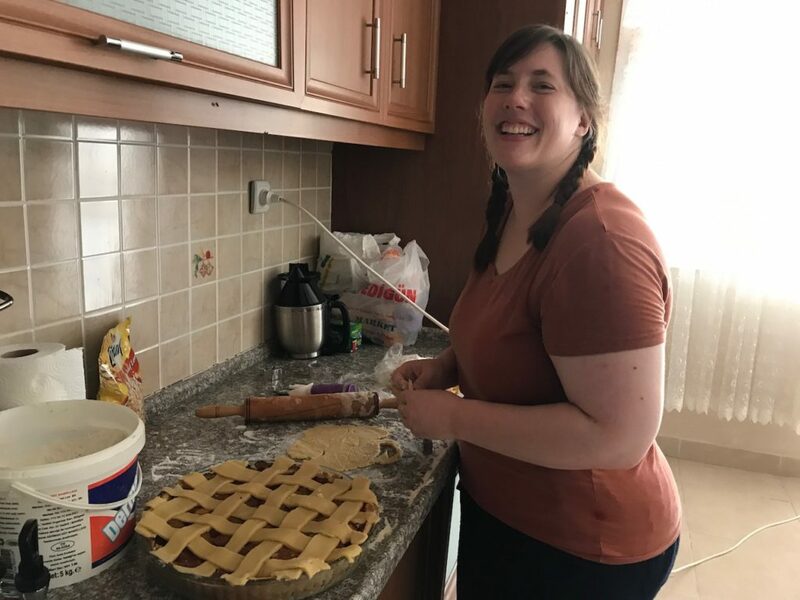 This year, we decided to make fruit pies for our annual 4th of July barbeque – a taste of the US while working in Turkey. 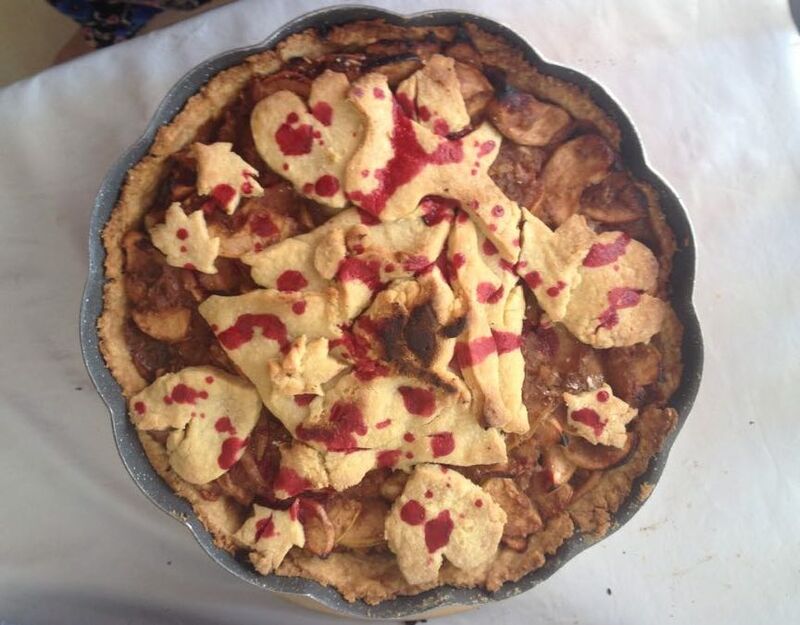 But making these pies was not without its challenges. 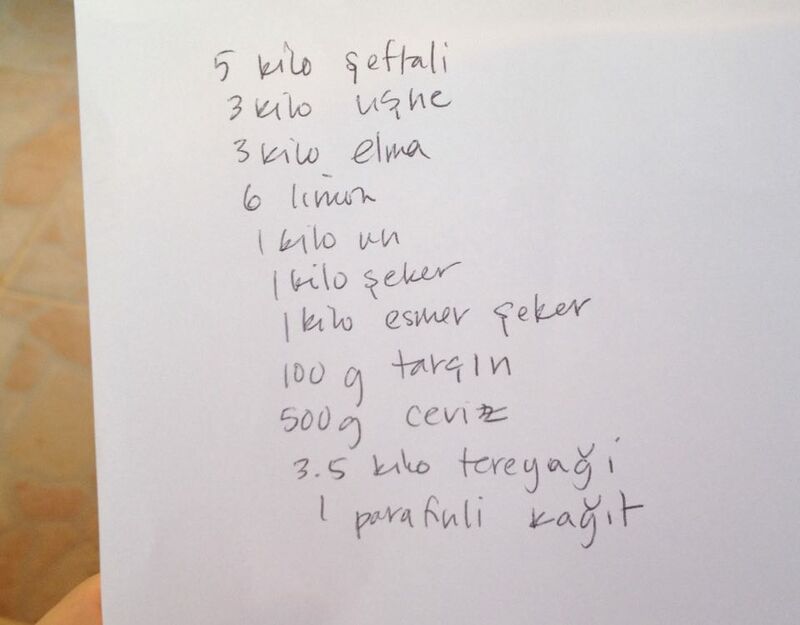 Shopping - do you think we have enough ingredients? 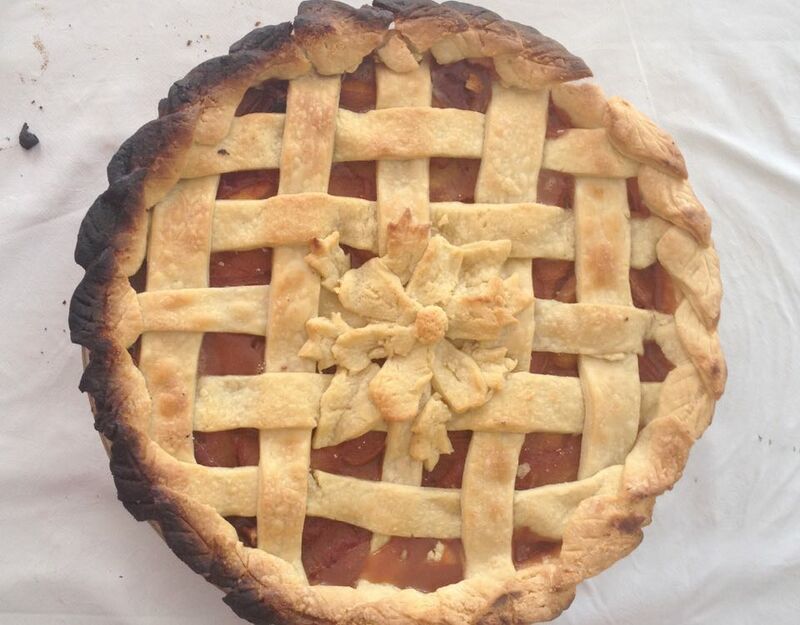 Using the oven, which cooks only one pie at a time at a constant and unknown temperature, gave the bakers an even greater appreciation for the cooks who use it everyday to make our food! 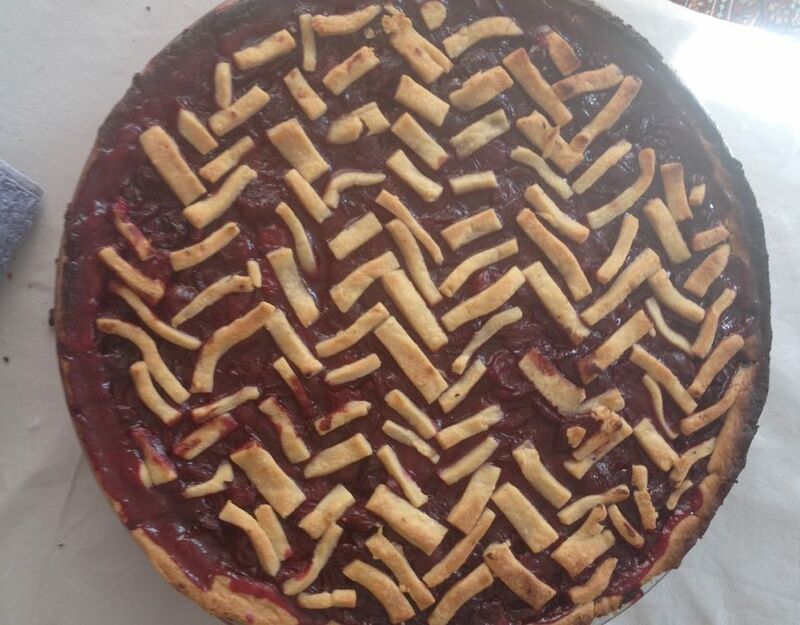 One crust completed, 2 more to finish. 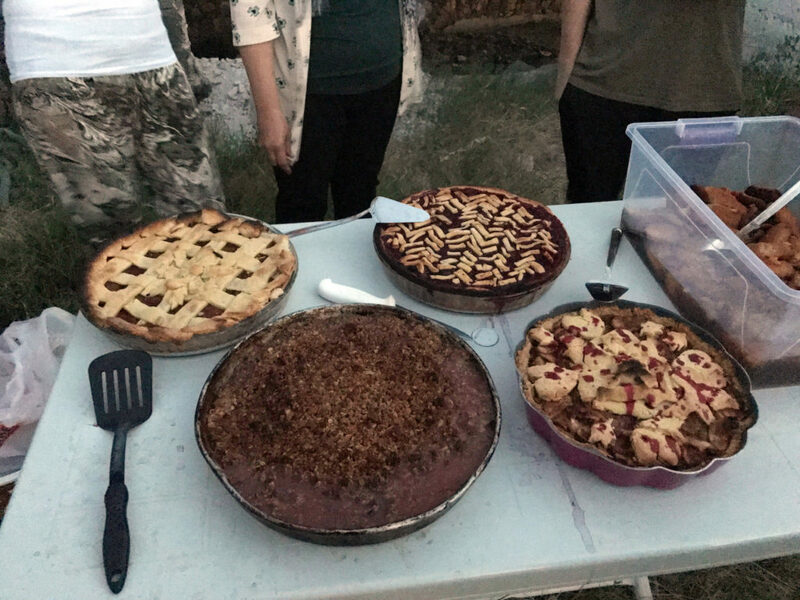 The pies and crumble were safely transported down to the shores of Lake Marmara for the holiday barbeque. Without exception, they were proclaimed a delicious success!!! 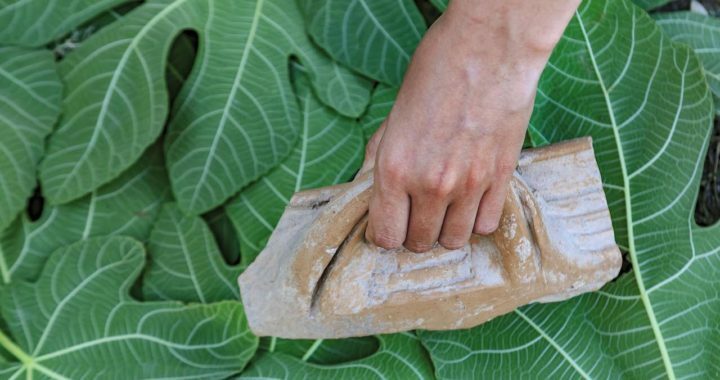 People in the past used pottery in many aspects of their lives, but especially during meals. 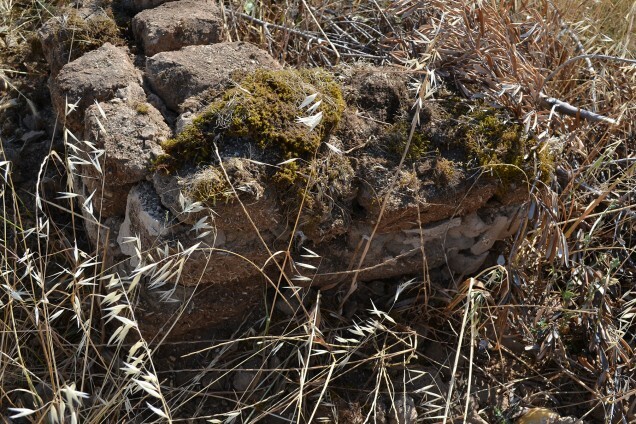 As we excavate each day at Kaymakçı, we uncover these vessels, broken into pieces and scattered throughout the site. Many of these vessels are bowls, useful for multiple purposes during meals. As we work with these vessels, we have the chance to touch and hold them as people did in the past. Handles on the sides of the bowls still fit well in our own hands. Even though the vessels are usually broken, we can imagine how they would have looked when complete, in the past. In this way, we connect with the people who lived thousands of years ago based on our shared human activities of eating and drinking. 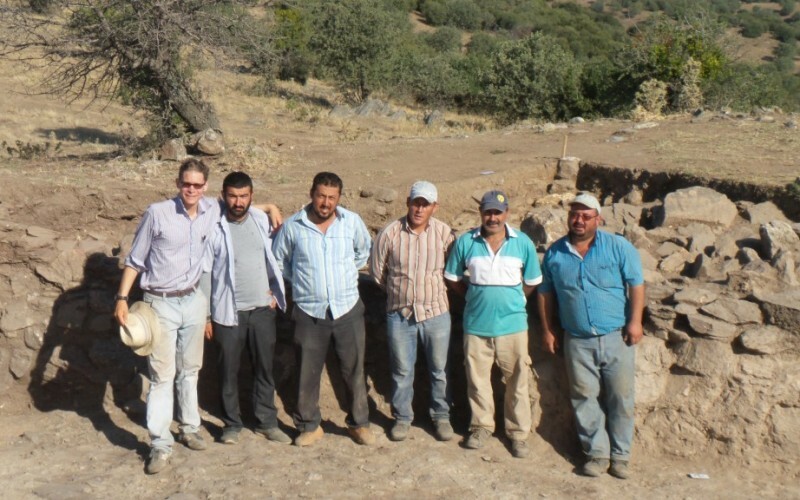 Meet the excavation team working at the northern edge of Kaymakçı’s citadel! 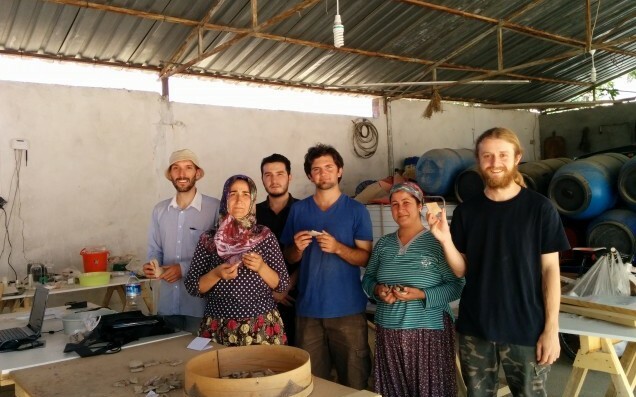 Our tireless and endlessly enthusiastic team from the nearby villages of Hacıveliler and Büyükbelen! 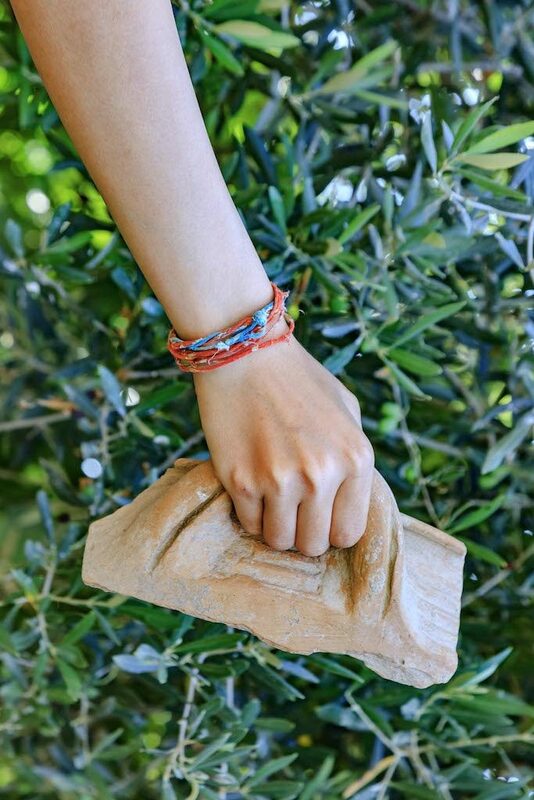 At times, objects come out of the ground that require hands-on explanation. 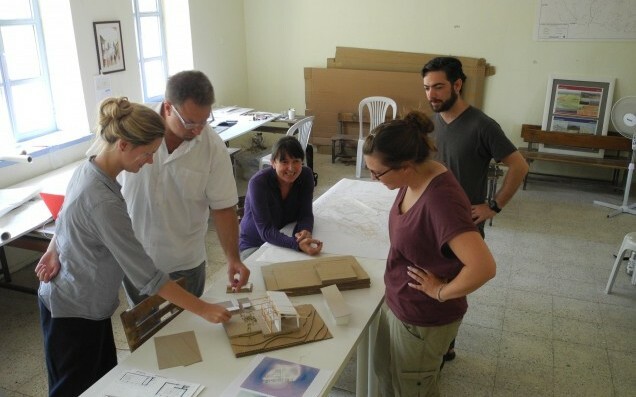 An inspiring aspect of working with this fine group of people is their eagerness to learn about the cultures and materiality that previously populated the areas they now inhabit. We eat a number of different types of bread during our breaks. 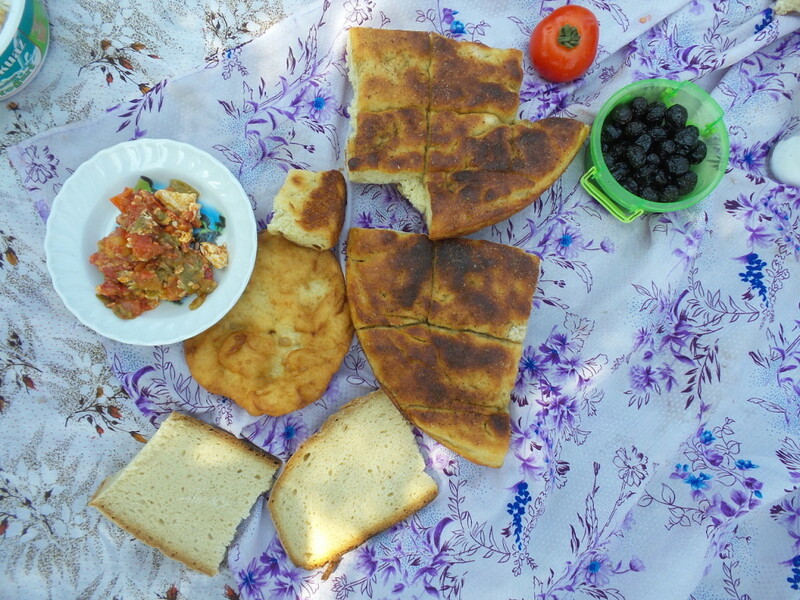 After explaining that the Hittites of Late Bronze Age Anatolia had at least 120 types of bread, our workers laughed proclaiming, “That’s nothing, we have 150 different kinds!” Here, you see three local varieties along with menemen, olives, and a tomato – all local fare. From an ethnoarchaeological point of view it is interesting to listen to descriptions of local histories and understandings of the past. This dialogue adds a different character to the archaeology we are doing on site! … at least temporarily. 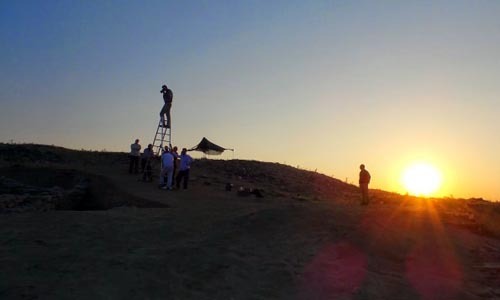 The excavation areas are now closed, and – in partnership with the Turkish Ministry of Culture and Tourism, the Manisa Museum of Archaeology and Ethnography, and Yaşar University – the Boston University Kaymakçı Archaeological Project has now rounded out its inaugural season! 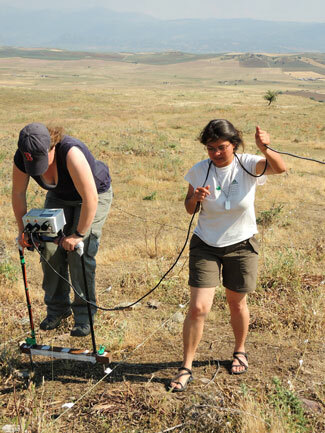 These new excavations supplement ten seasons of survey in the region, reinforcing the importance of Kaymakçı in our understanding of Bronze Age communities in the Marmara Lake basin and western Anatolia and the nature of their connections to central Anatolian and Aegean communities. We are grateful to everyone who participated: 60+ crew members from communities in the region as well as those affiliated with various universities in the US (Boston, Cincinnati, Delaware, Michigan, Mississippi State, Penn, Virgina Tech, UC Davis), Europe (Charles (Prague), Freiburg, Gröningen, UCL), and Turkey (Ege, Koç, Nevşehir, Yaşar, Yeditepe). grant writing and fundraising to support all these activities. 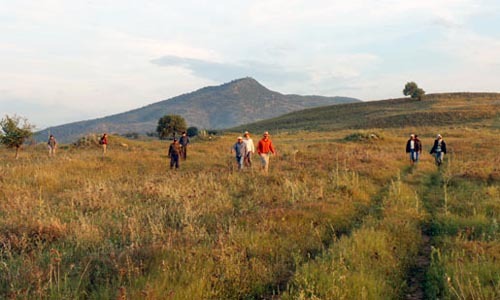 Our partners still in Tekelioğlu and at Kaymakçı will continue to assist in many aspects of the project, too, from planning gardens, to preparing for the construction of the research and educational center, to remaining vigilant in the long-term protection and preservation of the site. Also ongoing will be the weather station’s recorder – what better way to understand the impact of annual cycles of environmental conditions? Accompanying our WeatherBug and assisting our site guard, Ferit, will be an “eye in the sky,” a new night-vision enabled security system to help monitor the site while we are away. Thanks to all for following our “Voices” from the eight weeks of this season – we’ll look forward to keeping you as up to date as possible over the coming months. Until then, a traditional watery goodbye! 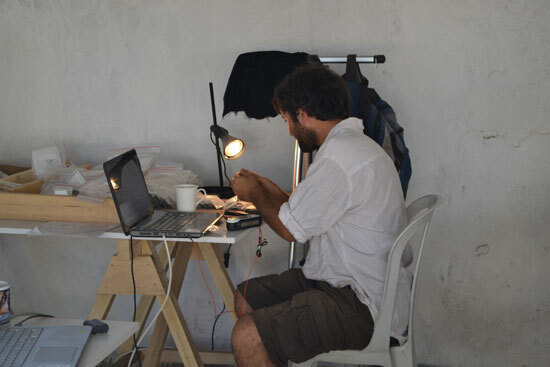 At 10 am each day (on site and in the laboratories), we have a morning tea or “çay” break. 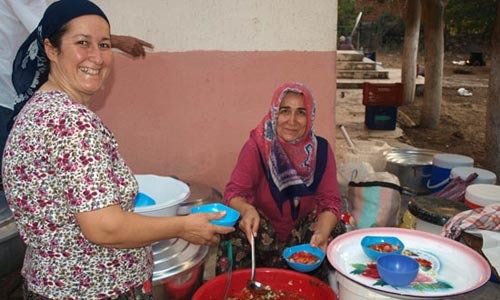 Müslüme and Ayşe prepare wonderful breads (sweet cakes, often with a touch of lemon or cinnamon) or savory treats. Today we had a light pastry (börek) filled with a crumble of cheese, parsley, red and green peppers, and a touch of olive oil. Each season the team takes a well-deserved 3-day break – a chance to get away, relax, and rejuvenate before the second half of the season. The break this year was at the beginning of last week. Destinations included Çandarlı and Bodrum (and their nearby beaches and fabulous calamari), and visits to Priene, Didyma, Miletus, and İstanbul (a short flight from İzmir). 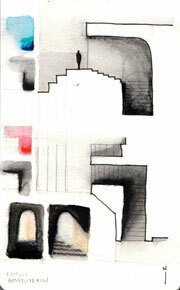 Here Tim Frank shares some of his sketches from nearby locations. One of the closest tourist locations to us is the ancient site of Sardis. It has become a tradition to celebrate the 4th of July with our old friends and colleagues there. Nick Cahill, director of the Archaeological Exploration of Sardis, gave our crew a terrific tour of the excavation areas, followed by a cocktail party, dinner, and a moonlight night in the Temple of Artemis. This week we worked with excavated and washed ceramics, organizing them by form, color, material, and size, tagging and photographing them. We then made 3D models of ceramics displaying diagnostic features by scanning them with a NextEngine laser scanner. We then trimmed and organized the 3D models. Furthermore, we entered into the database the counts, color, and weights of the other ceramics we photographed. This is what we generally do in the ceramics lab. Both of us think that working here has been a very educational experience and also a lot of fun! 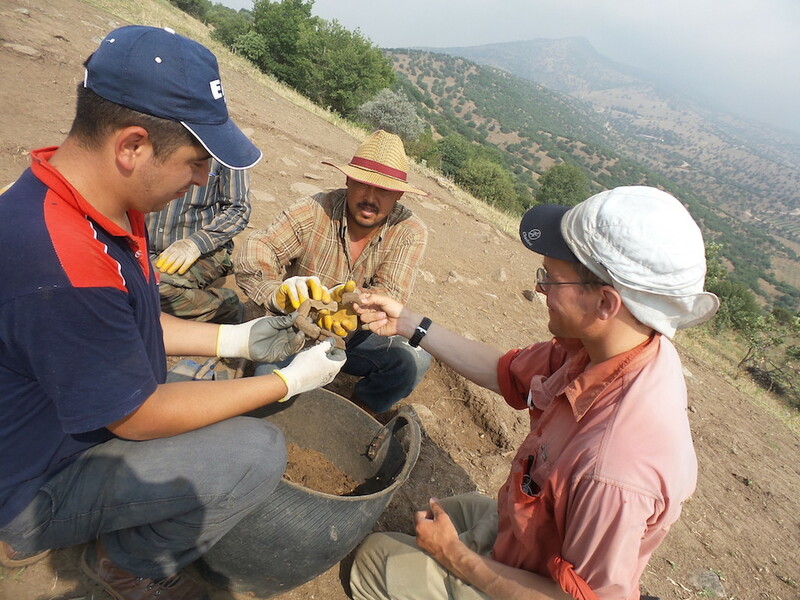 Now well into our fifth week, the excavation areas are getting deeper, the workload ever increasing, and the Turkish-English barriers slowly melting. 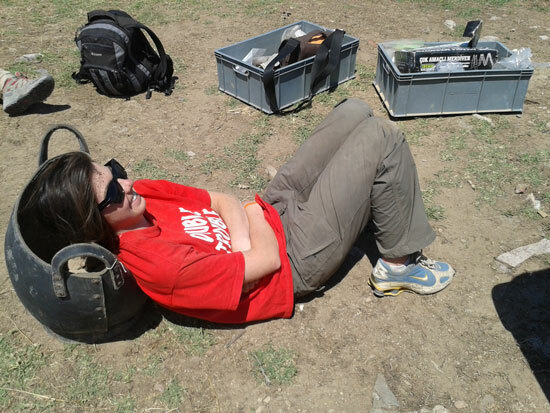 As an excavation area supervisor, I have been busy in the field and the lab processing finds, recording and directing the excavation of my area, attempting to interpret the uncovered material, and sometimes even picking up a trowel myself (!). 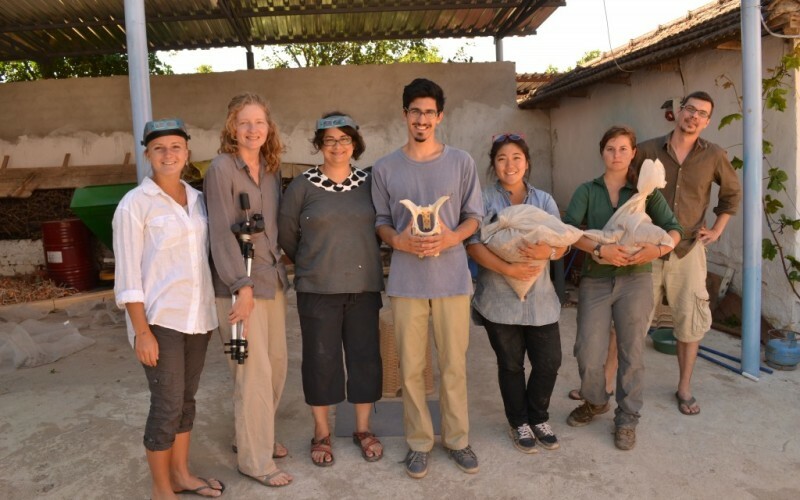 To help with all of this, members of the project who work primarily on pottery, bones, and botanical remains rotate through the field twice a week to bring fresh perspectives to the excavated material. 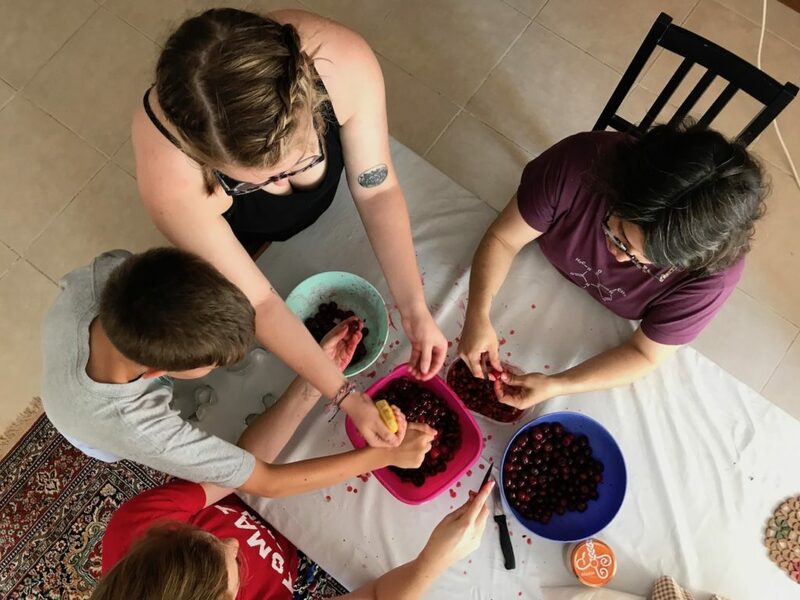 While I get help from these members on a rotating basis, I share the workload with members of local communities every day, who kindly put up with my çok kötü (very bad) Turkish and bring me delicious homegrown fruit! 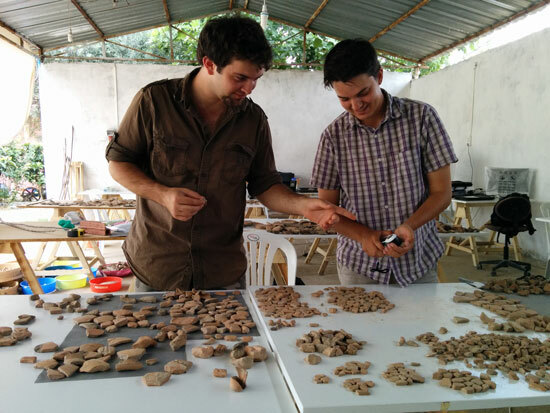 The use of photos in archaeology is more than 100 years old. 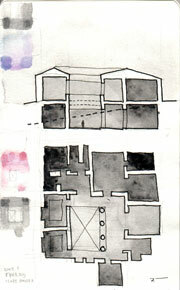 Most archaeologists combine photography and traditional drafting methods to record and interpret architecture, artifacts, and soil deposits uncovered while excavating. This includes both formal (publication quality photography) and less formal photography. 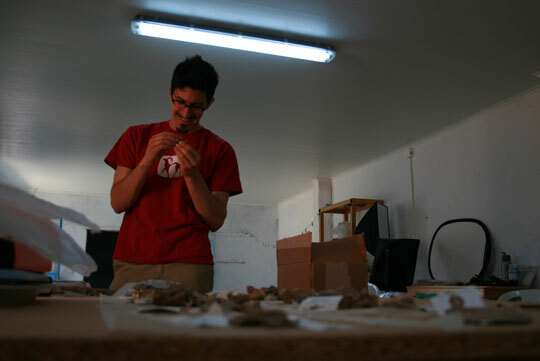 The latter, less formal or candid photographs have been used to record the excavation process, creating a visual record of that which is destroyed in the process of extraction (while many archaeologists quip that “excavation is destruction”, our project director likes to say that “excavation is digitization”). 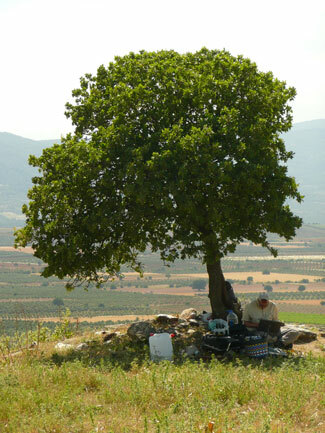 Both kinds of photography continue to be used at Kaymakçı. 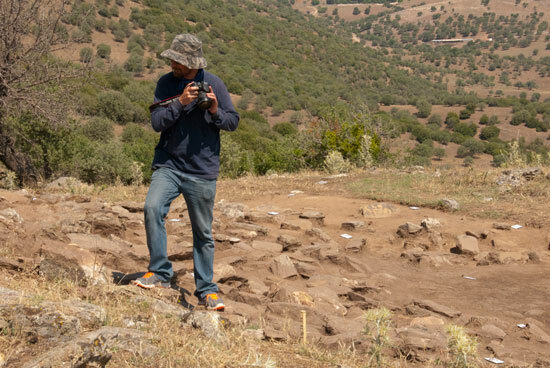 From the first day, however, excavations at Kaymakçı have also extended the use of photography to include the production of 3D models. These are made from composites or mosaics of photos rendered in 3 dimensions and oriented to a GPS-surveyed grid. These computer models display soil layers, artifacts and architectural features with a high degree of precision. 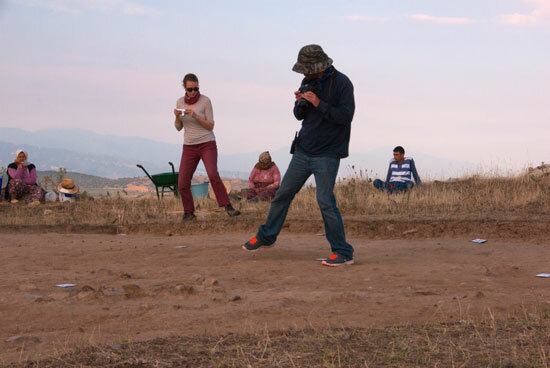 The models record the processes and decision making of excavation accurately and allow the viewer to move back and forth in virtual excavation time and space in order to better understand the relationship between soil layers, walls, floors, etc. Has all of this use of new technology and the use of new programs gone smoothly over the last few weeks, without a hitch? Absolutely not. There have been hitches! Have workflow and results gotten better with each day? Of course! The procedures are becoming commonplace and the glitches ironed out as they spring up. As we have learned in the last few weeks, there is an art to doing science. As seen in the photos below, there is definitely a choreography to the photography. With luck, photography as science and the art it produces will enhance our presentation of archaeology to an increasingly visually oriented public. 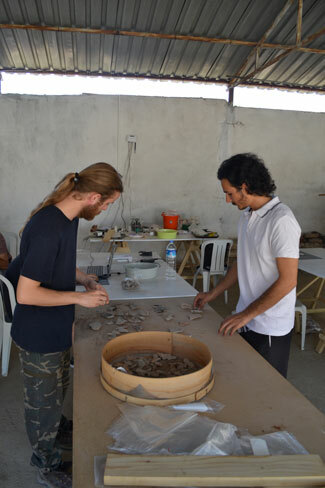 Activities continued apace this week with the Kaymakçı Archaeological Project. We continue to be paperless thanks to the technological expertise of many team members and the patience of many more! The 3D recording of trenches, samples (especially ceramics), and landscapes provides not only visualizations of ancient entities as well as our own workflows and knowledge bases, but also new opportunities for conceptualizing and understanding the holistic endeavor of the human experience over time. Elected as Young Society Leaders to the American Turkish Society (ATS) in Fall 2013, Christina and Chris have had opportunities to expand their networks in Turkey and to understand where and how politics, design and development, field work, and education fit best within the arc of policies and U.S. – Turkish relations. A recent summit in İstanbul – a first for the YSL group – was a great success. 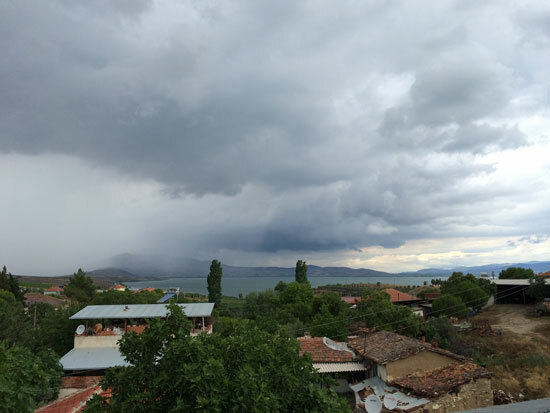 Christina presented on fieldwork, cultural diplomacy, and policy (“Cultural Relations in the Gediz Valley: US – Turkish – EU Initiatives”) and Chris focused on the many impacts of technology on field research (“Research + Technology: A 21st Century Approach to the Past in the Gediz Valley”). Our diet has shifted as the hotter and drier summer season begins. 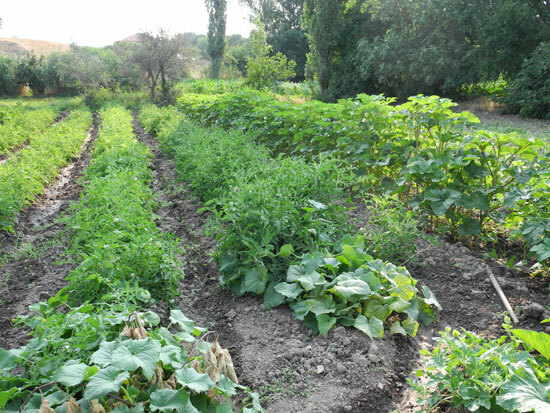 The crisp lettuce is now gone; the tomato plants are almost fully ripe; the peppers are not far behind; and patches of mint and oregano grace the fields around us. Among the staples of our diet is now purslane (semiz otu). 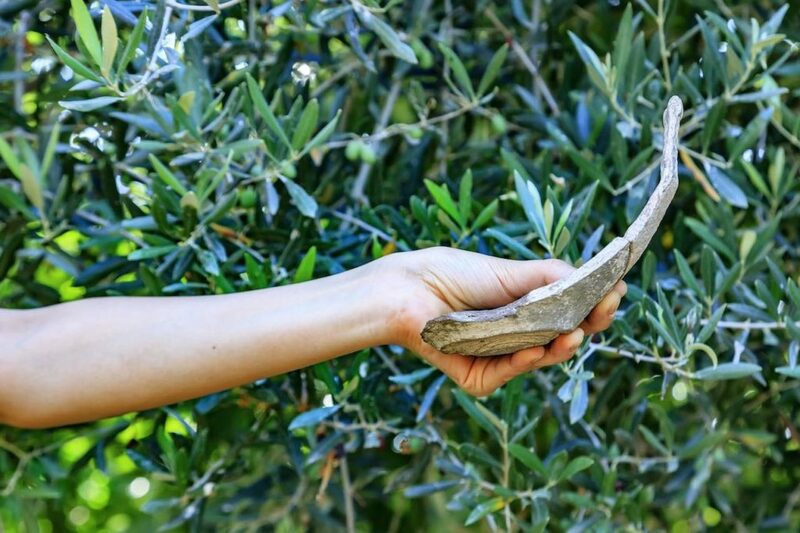 It grows in abundance as an undergrowth crop in olive groves and even fallow fields. 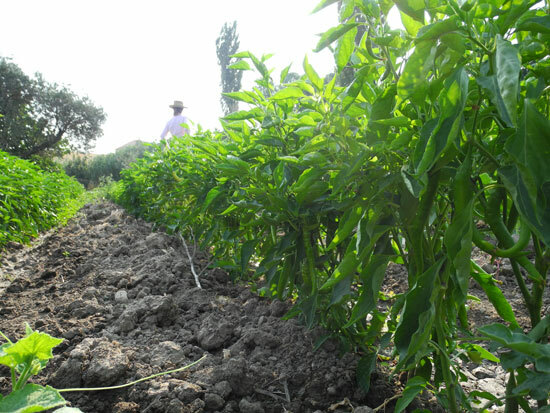 Our cooks have mastered the use of this specific ‘weed’ in many ways, but our favorites are to have it sautéed with garlic and covered with a savory yogurt sauce, mixed with rice or bulgur, or served fresh in cucumber and tomato salads with a hint of mint. Another perennial favorite is stuffed grape leaves rolled long and tight here in the village and stuffed with a rice and bulgur mix and flavored with mint and olive oil (here called sarma, elsewhere dolma). 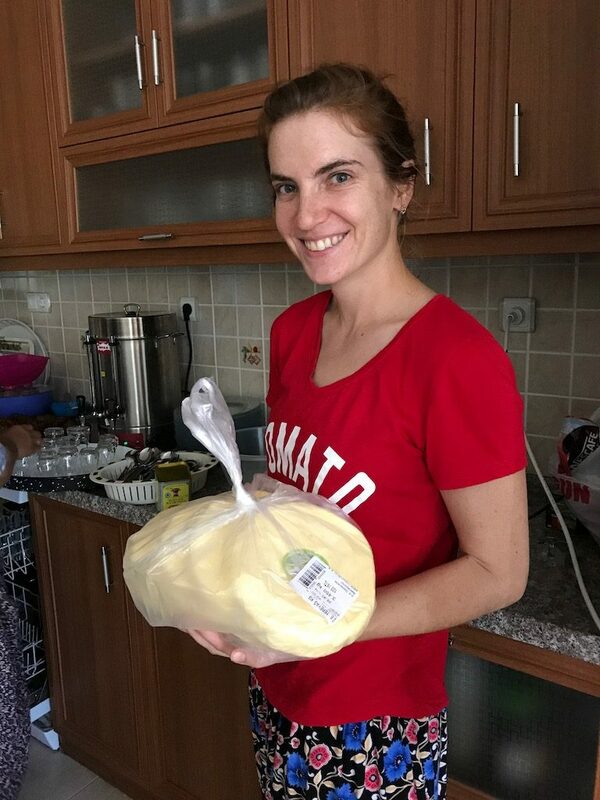 In addition to the fresh breads, we’ve also been treated to fresh gözleme and pişi (complete with cheese made by our hosts as well as pekmez, a grape molasses). The majority of the ingredients for these dishes – grapes, grape leaves, parsley, purslane, onions, and mint – come from the local farm. As our paleoethnobotany work begins in earnest (with the floatation tank now complete thanks to the expertise of John (Mac) Marston and the welders in the Salihli sanayi), we hope to learn much more about ancient diets. In addition to enjoying the food, we are continuing to enjoy long days of hard work. 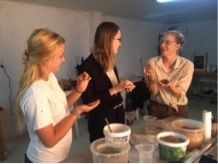 The excavation team is seated around the breakfast table at 5:15 am, the conservation and lab crews at 6:15am. Below are the highlights from some of the project’s work over the past week. Look for more to come next week! A long-term component of our work here is to understand landscape changes over time. 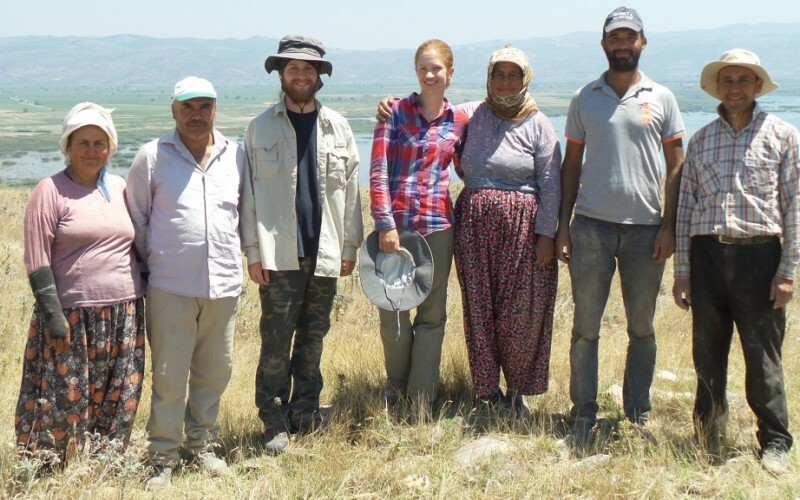 While we’ve got a firm understanding of the past from 10 years of survey, as well as an understanding of recent policy and landscape changes in the Gediz Valley itself, we hadn’t had the opportunity to work on deep histories within specific communities. We’re in the process of doing so now in academic contexts (via publication) and hope to unveil a community-based website initiative by late Fall. Ongoing conversations with community members include walking tours, object biographies, and place-based experiences. Here cyber-space becomes increasingly meaningful in the context of people-to-people relationships and life-long learning. 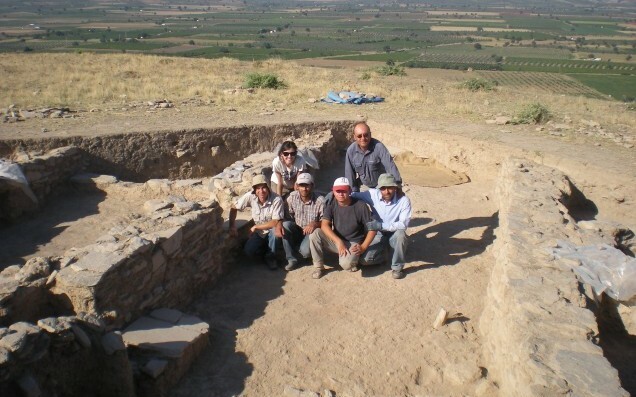 This week at Kaymakçı we started uncovering selected parts of the citadel. In my excavation area, we first excavated the topsoil, which was regularly plowed in the past and as such contained modern and ancient artifacts. 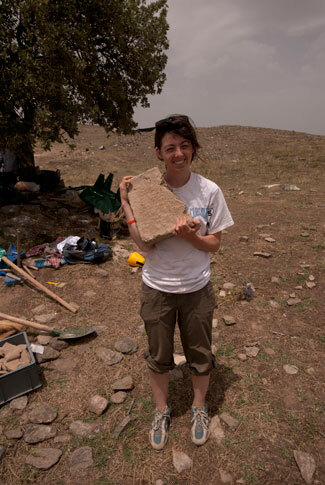 After having removed it, we began to explore the Bronze Age occupation at the site. 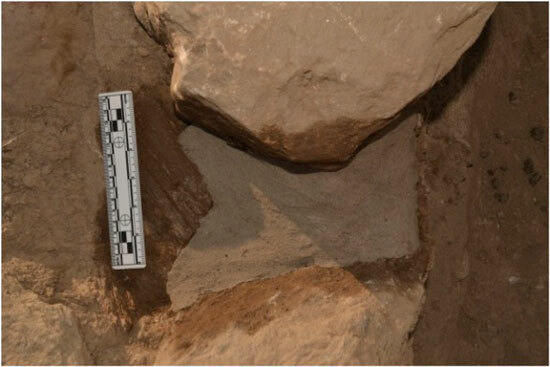 In conjunction with architectural features including walls, we have found pottery for storage, eating, and cooking purposes, bone, stone tools such as grinders, and some small finds. All these different classes of artifacts together give us clues about how people lived here and how they engaged with the environment around them. 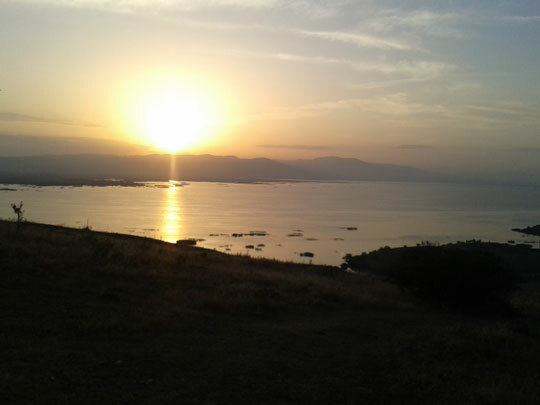 Sunrise over Kaymakçı. The excavation team begins work at 6am. Our team is currently focused on the schematic design of our planned research and educational center, a mixed-use facility that will support all Gygaia Projects activities for years to come! Our initial attention has been focused on the development of highly permeable building types, which establish gradual transitions between enclosed interior spaces and exposed outdoor spaces that orient towards the strong characteristics of the immediate context. This approach also allows the region’s abundant natural daylight and cooling prevailing breezes to permeate deep into building interiors. Hand sketching, physical modeling, and digital rendering are used to measure this relationship between interior and exterior space. The landscape architects worked this week on design and development at the site of the research and educational center in coordination with the architects. Work included generating design studies and design alternatives based on the spatial and functional relationships of the site, views, ecology, pedestrian and vehicular access and circulation, visitor experience, and site security. 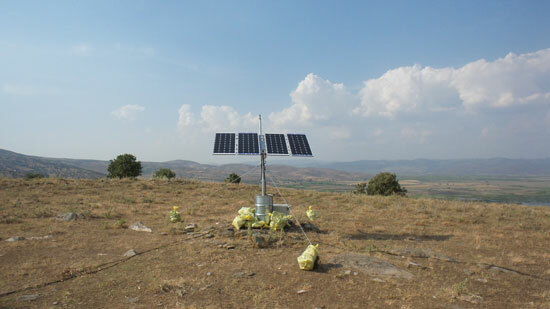 We installed a weather station this week at Kaymakçı! 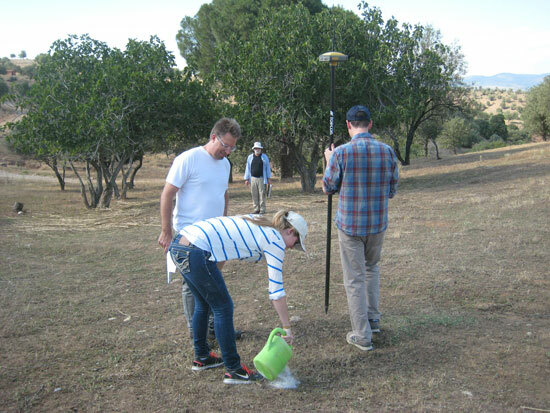 Weather data from the excavation site will be transmitted real-time to devices around the world via the WeatherBug network. 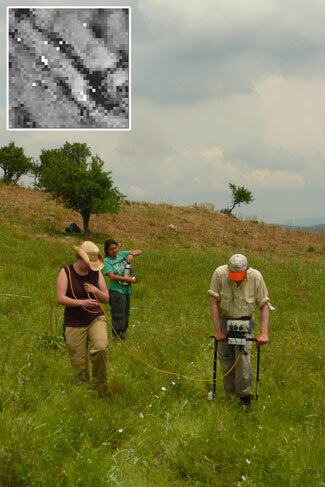 This data will also be logged long-term to understand better the environmental conditions affecting our conservation and restoration of archaeological remains as well as Bronze Age approaches to spatial organization and design with respect to natural elements. This week in conservation we tested three mortar mixes that included different ratios of cement, sand, lime, and soil to see the different characteristics of each. We also analyzed the stickiness of four soil samples that came from excavation areas and locations on the living landscape. 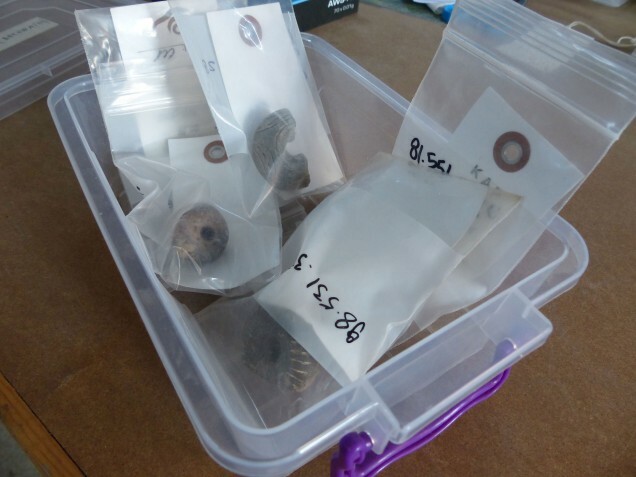 Finally, we have been cleaning artifacts that have been coming into the conservation lab from the field. This week we’ve begun to build the beginnings of a comparative collection. Before cooking local sheep and fish used for our meals, the faunal team worked to preserve and clean the bones for future study. 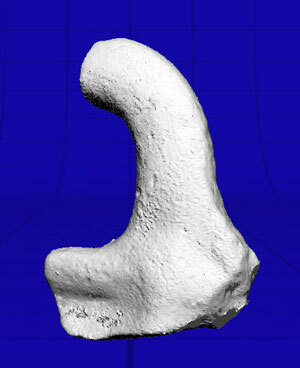 The modern bones provide an invaluable means of studying archaeological bones. In addition to preparing specimens for later comparative collections, we have begun to analyze bones recovered from the excavation. 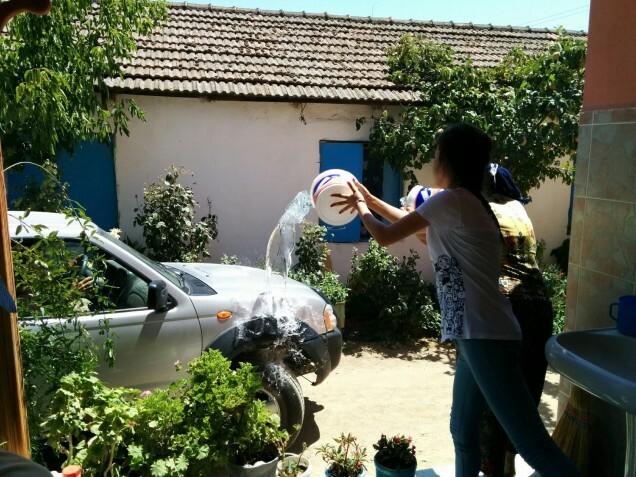 This post begins our series of Voices from the Field, a means of disseminating news about the activities of Gygaia Projects in a popular format. 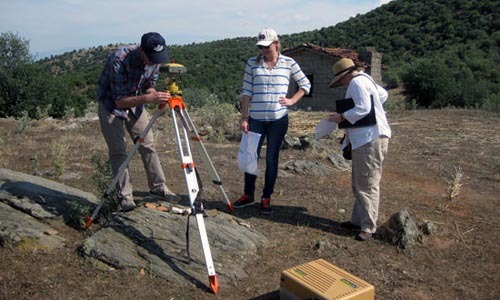 Work so far this year has included geophysical survey under the Central Lydia Archaeological Survey and a host of activities relating to the Kaymakçı Archaeological Project. 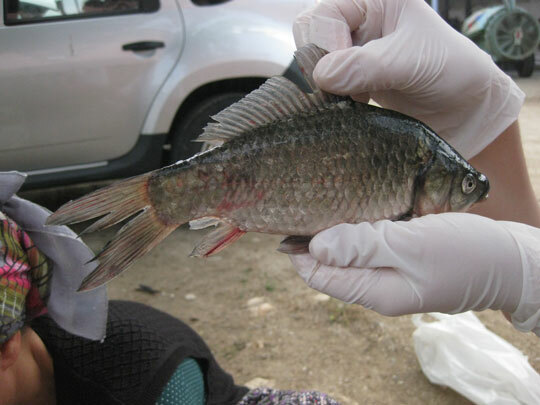 For Voices from the Field, we’ve asked project participants to write up brief photo-reports based on talks with and visits to the various areas of activity that make up our research program. This week’s post comes from the directors and their leadership teams. 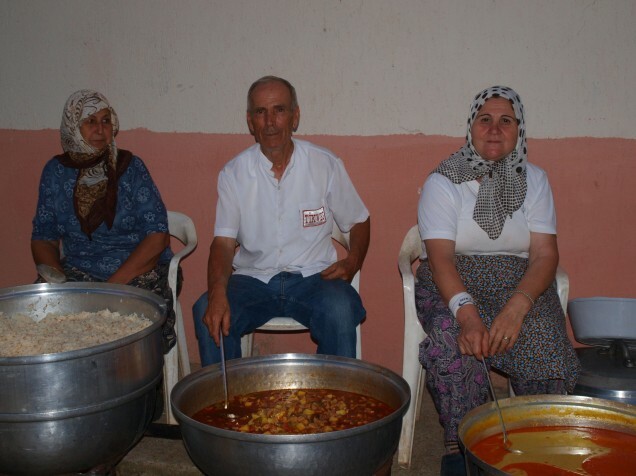 As in past years, we’re based in the small community of Tekelioğlu. 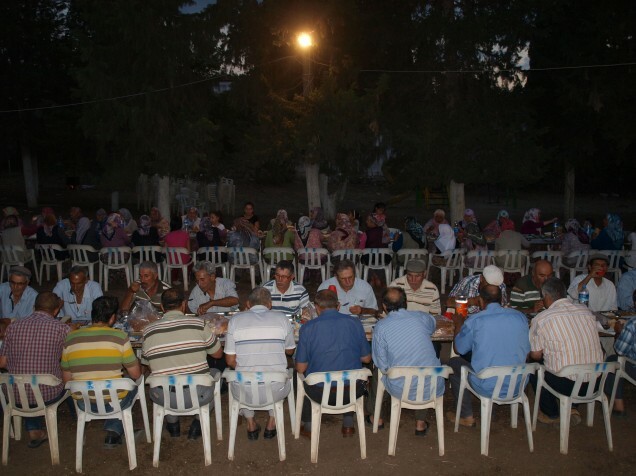 During this summer season, we make up 10% (30 people) of the population (300 people). 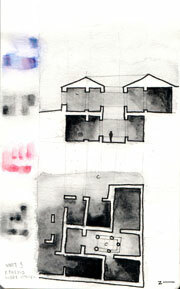 Team members are set up in various rental houses with our base of operations at a central location that includes two laboratories (a “dirty” lab for conservation and environmental archaeology and a ceramic processing area) and a studio for architectural study, spatial modeling, and GIS research. We are at capacity and looking forward to the construction of a research and educational center – plans for which are underway! Our cooks are once again making our work easier. 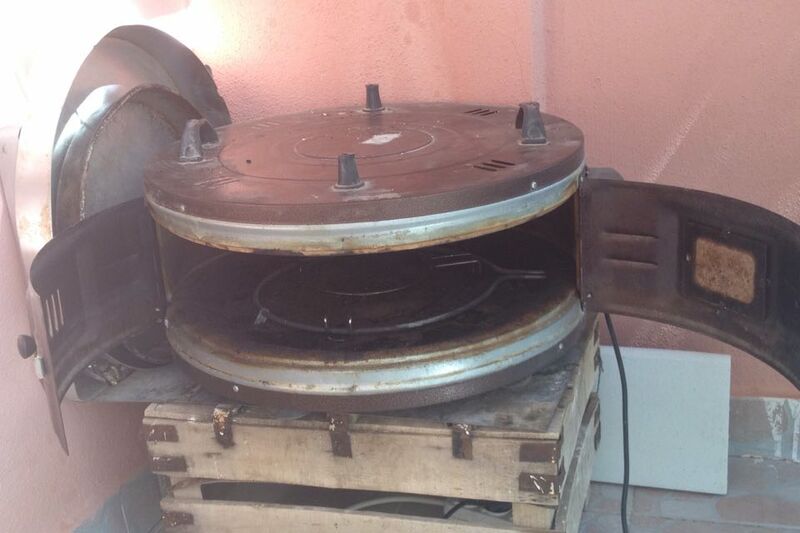 Bread is baked on-site in earthen ovens and eggs – as well as lettuce and other produce – are fresh from the farm. 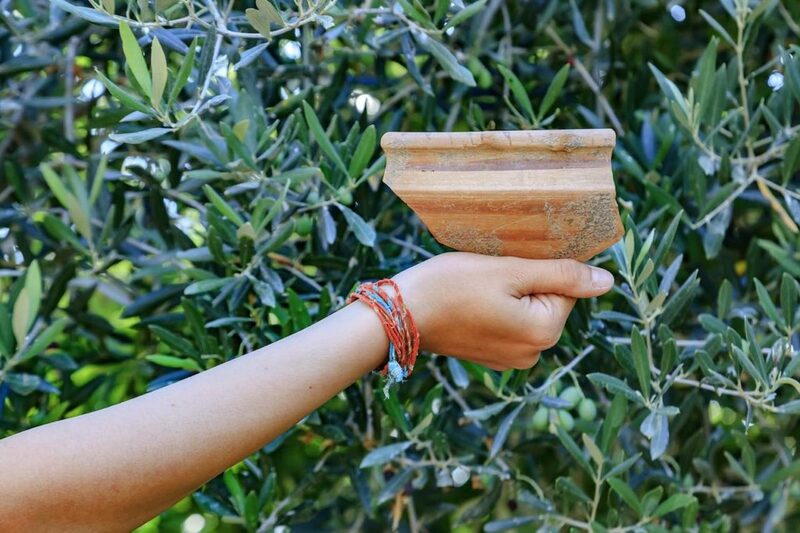 As always, the olives and extra virgin olive oil from the surrounding fields are favorites. 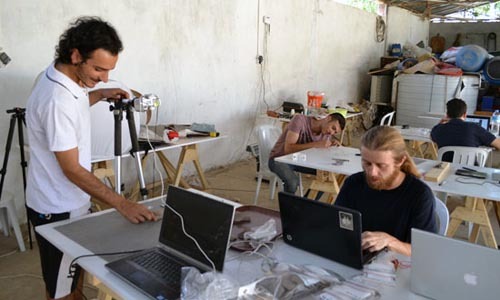 With the inception of excavation at Kaymakçı, the project has established an integrated recording solution that processes laser-scanning and photogrammetric point-cloud data into rendered digital models in near-real time to increase the efficiency of archaeological field recording. Needed for this system was a robust wireless connection between excavation site and labs and the electricity to power it. 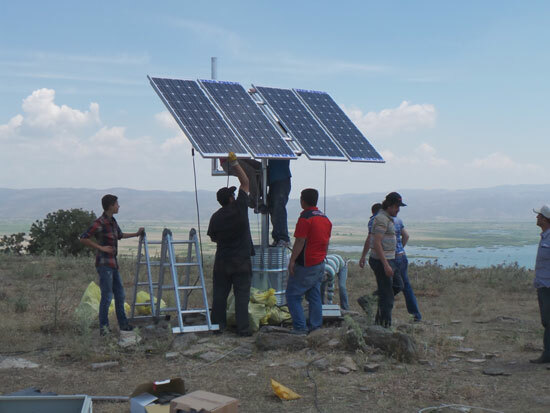 The implementation of this system, which we call “GygaiaNet” has included the installation of a Point-to-Point wireless system and a photovoltaic (PV) system to power it. 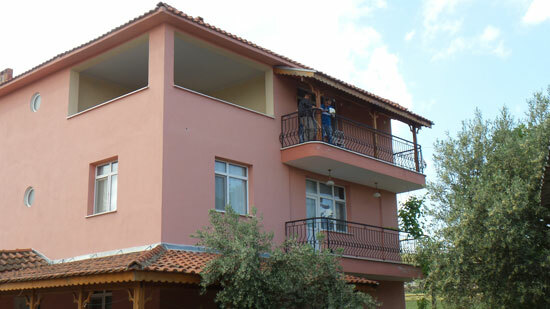 The signal is beamed from an antenna on the third floor of our home base in Tekelioğlu over 6 km to Kaymakçı. 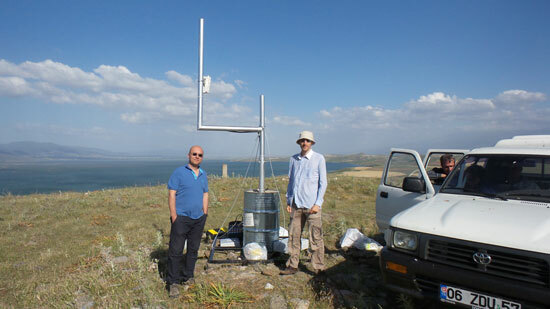 The receiving antenna is on the tall bar of number four-shaped wireless-PV mast, between Sinan Ünlüsoy (Assistant Director for Excavations) and Peter Cobb (Assistant Director for Information Architecture). For reference, Tekelioğlu is on the lake shore between Peter and the car door. 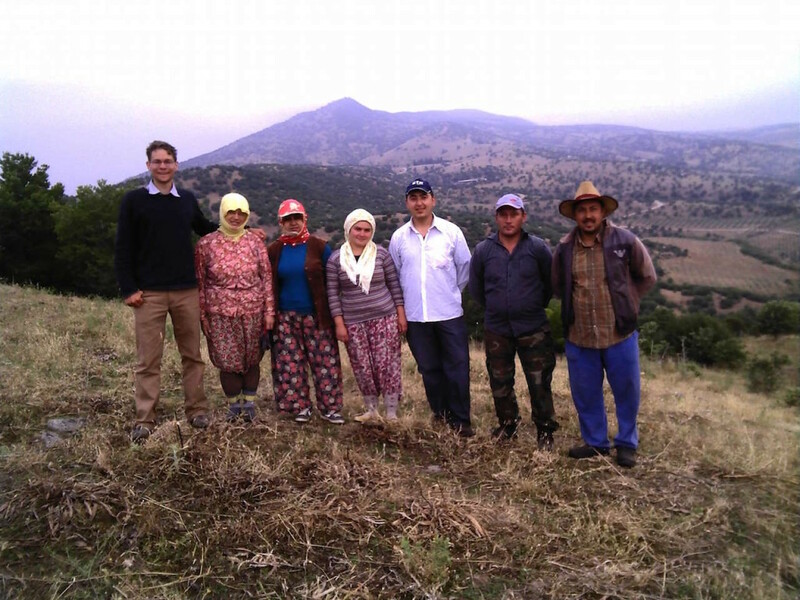 A team from Salihli installed the PV system. The wireless-PV mast is anchored with guy wires to buffer against strong winds. From this central point, electric and fiber-optic cables carry the signal in three directions (visible to left and right along the ground) to wireless access points near each excavation area. The system will be complete once we install a local weather station (to see just how strong local winds are!) and a wireless security camera to help monitor the protection of the site. 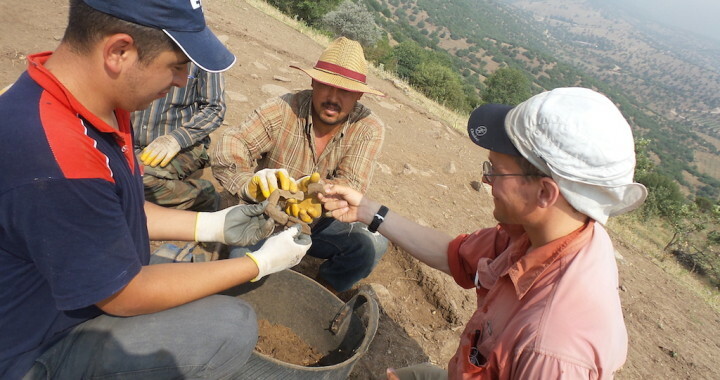 As we excavate each context on Kaymakçı, large quantities of the material remains of Bronze Age culture are uncovered. 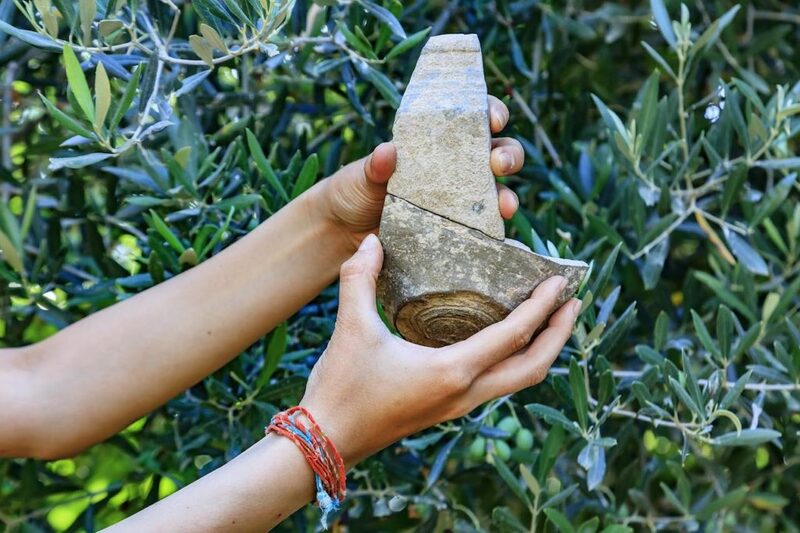 We find objects of everyday use such as ceramic bowls or animal bones, as well as the occasional special object made out of metal, stone, or other materials. 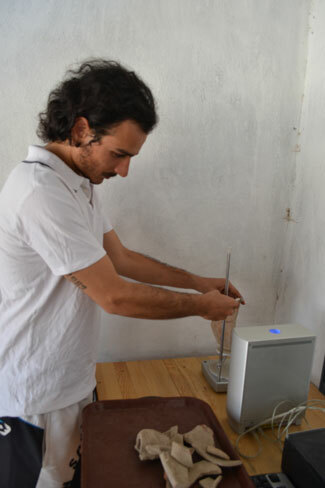 As we collect these, they become “samples”, which are brought to our Tekelioğlu base of operation. Here, we sort them by type, photograph them and record important analytical data into our centralized database. We have also begun to use a portable desktop laser scanner to create digital 3d models of some of the objects so they can be studied from anywhere in the world. By collecting all of these data about the objects used in the past, we are able to understand how people lived thousands of years ago. 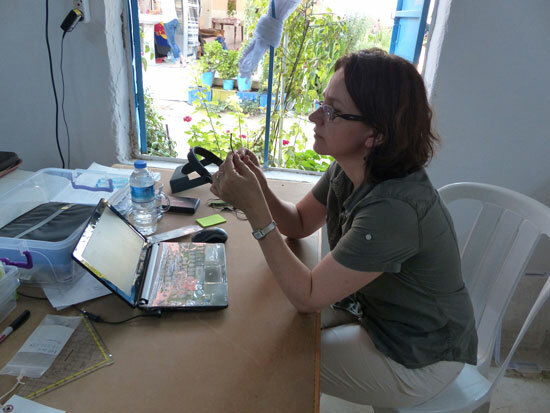 Electrical resistance survey continued at Kaymakçı in preparation for the excavation season. Electrical resistance survey is conducted by inserting mobile and remote probes into the ground at regular intervals and measuring the resistance of the completed circuit using specialised equipment. 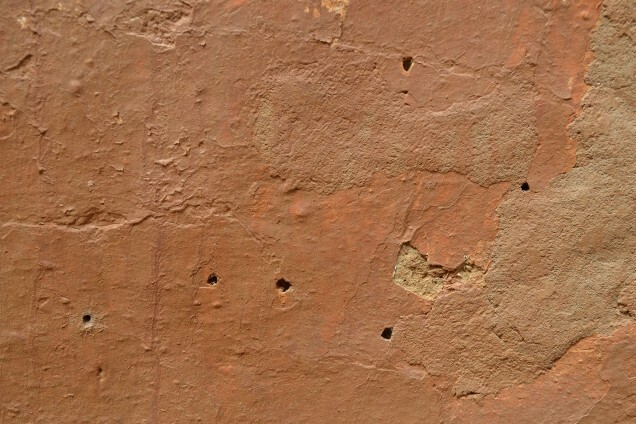 The data thus collected is processed into an image of the buried archaeological features (upper left corner). 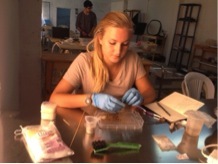 Although most of the processing is typically done in the lab, data can be checked in the field when necessary. Good ground moisture is preferred for electrical resistance, but dryer and harder soils can still be surveyed, albeit with increased difficulty. 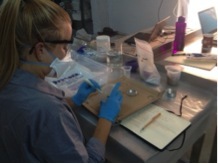 During the first week of the KAP excavation season, conservation team members organized the new lab space, as well as prepared micro-chemical material characterization tests and mixed adhesives for use during the excavation season. 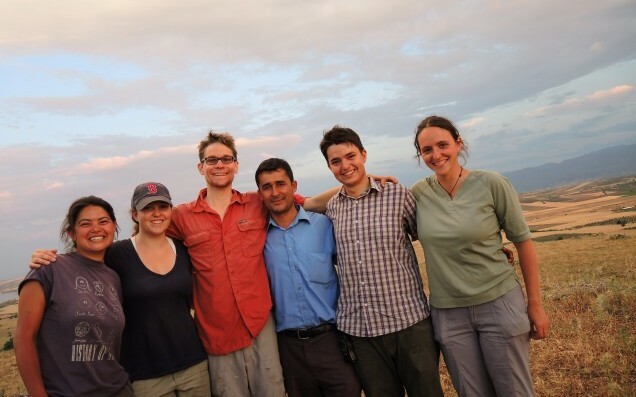 Experimental mortar and grout mixtures, exposed to the elements since the end of the 2013 field season, were assessed by team members for condition, durability and weathering properties. 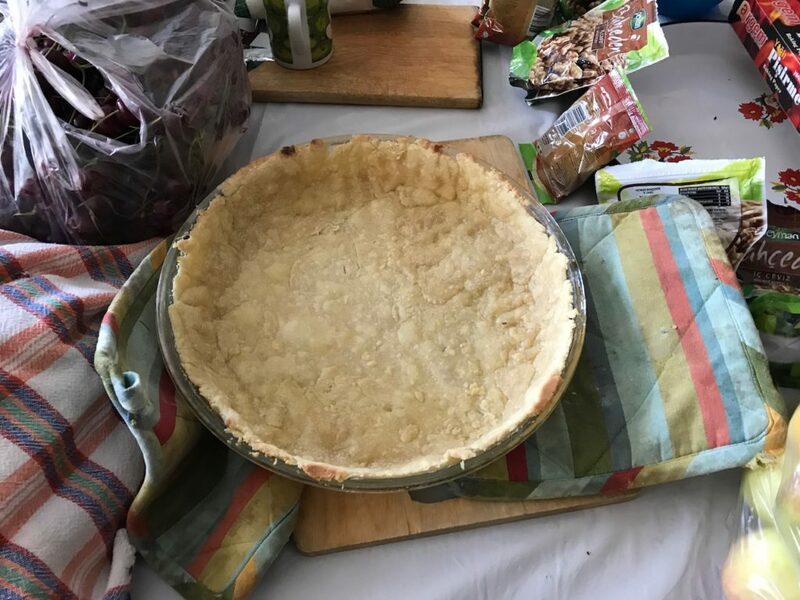 The majority were in very good condition and selected recipes will be adopted for use with mudbrick and stone masonry on site. 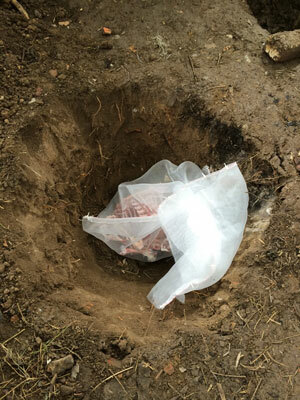 During the first week of the 2014 season, despite unseasonably cold and rainy weather, the environmental archaeology team set up our laboratory facilities, arranged for the construction of a new flotation tank, and scavenged the village for animal bones to begin to build a comparative collection. 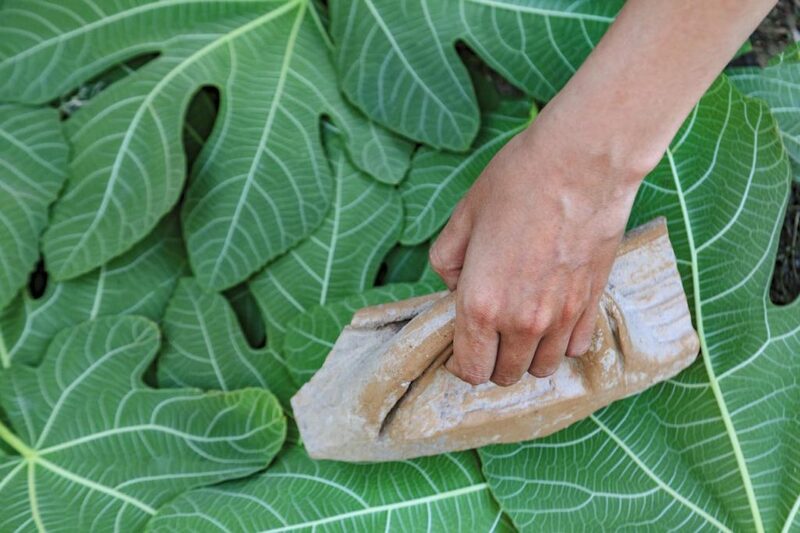 Flotation is the process by which ancient plant remains are separated from archaeological soils and requires a water source, pump, and tank for cleaning the soil and collecting the plant remains (mainly seeds). In order to identify animal bones from archaeological sites we compare fragments of bone found during excavation to skeletons of animals that lived near the site—a comparative collection—which we assemble from modern animal bones in the area today, burying them carefully to remove any remaining soft tissue through natural decay.